We are only able to ship to U.S. and Canadian addresses. The Guide to Property Tax Valuation presents practical advice to solve specific ad valorem tax valuation problems. This book explores (and, when possible, resolves) the practical ad valorem tax issues facing corporate taxpayers, valuation analysts, state and local tax lawyers, and state and local tax administrators. This book summarizes the consensus of the current thinking of ad valorem tax valuation practitioners. “This book is the most authoritative text dedicated to property tax valuation principles that I have ever reviewed in my 30 plus years of property tax practice. It is a comprehensive analysis addressing valuation issues important to attorneys, appraisers and property tax professionals. 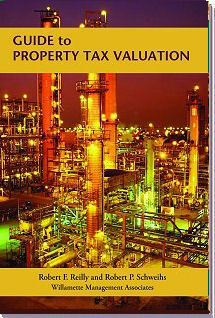 Every property tax practitioner’s reference library should have a copy." The price of this book is $59.95 (US), plus shipping. You may order the book by contacting Charlene Blalock at cmblalock@willamette.com, or 503-243-7509 .